An incredible cultural troupe from Ibadan performed astonishing bata dances and Kayode joined in with his own Yoruba drums. People told us a local television station broadcast the party on TV but unfortunately-like all of my prior television appearances here- I never catch them. 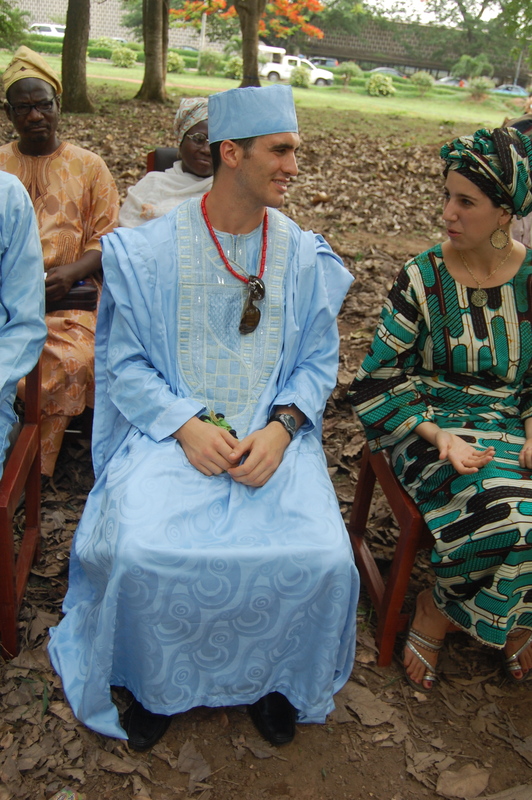 Kayode in his Yoruba dress, an agbada made of guinea and a fila. 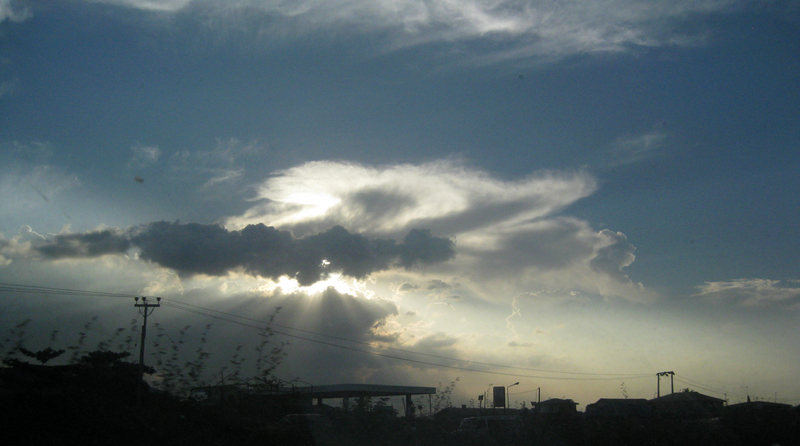 I experienced this sky on entering Ibadan on the way back from Lagos. I love clouds and this made me think of the heavens opening up. I love it. What the Student Union Building on the University Campus looks like when there is no electricity. 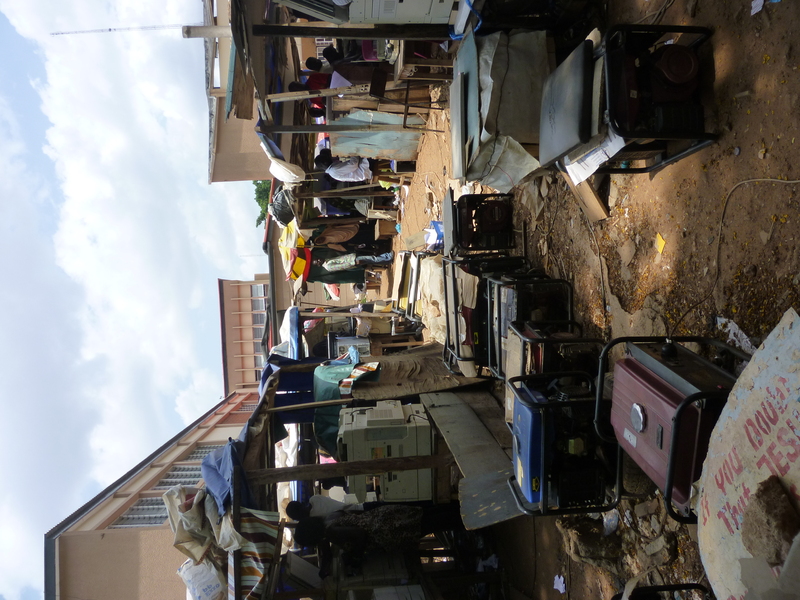 All of these are little generators that power the many copy machines and computers running at different stalls. Copying books and hiring people to type essays for you is a big business on campus. 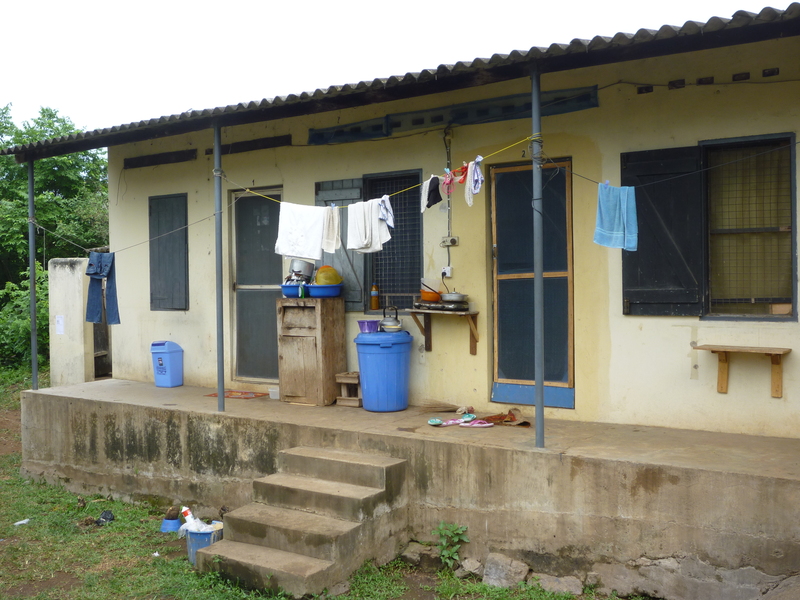 UI students who do not live in dorms, or hostels live in places called Boys Quarters. This is a block of Boys Quarters where some of my friends live. I hang out here often. 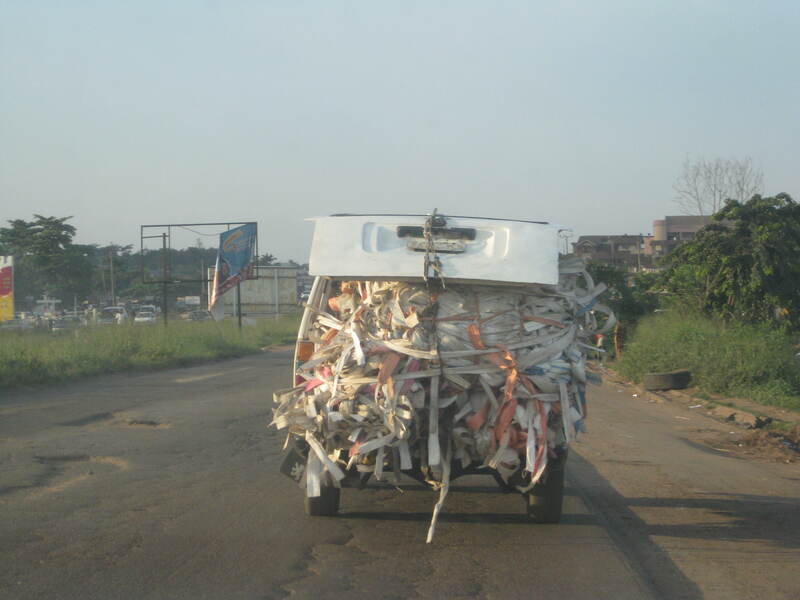 A danfo, what we call mini buses that act as taxis, that is ridiculously full of some strange objects that I cannot identify. With the way danfos are packed to the brim with bags of rice, beans, pieces of cow until the back of the car is almost touching the ground, it's a wonder they can actually move. Welcome to the butcher. 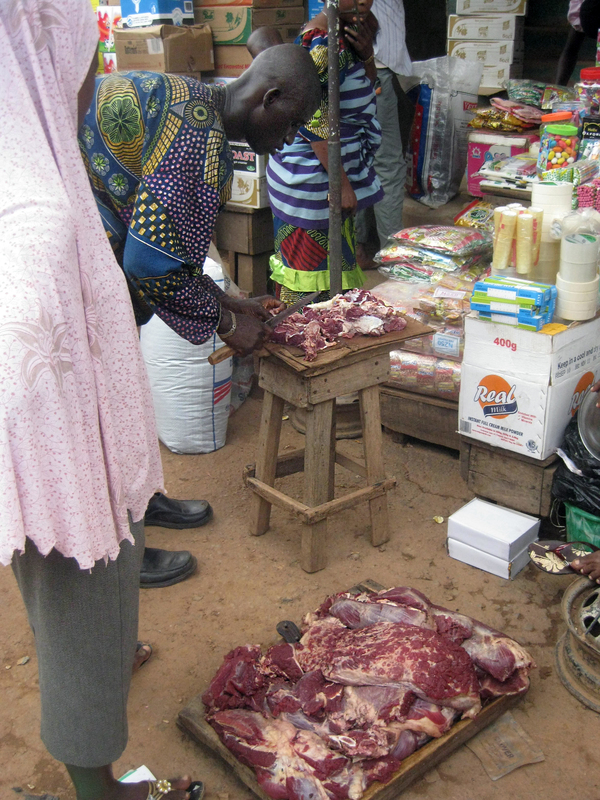 Men carry wooden boards on their head and hawk huge slabs of meat around the market. The meat sits out in the sun and is not covered from flies or any other thing. If you want to buy, he takes it off his head and cuts you a piece, as seen in this picture. 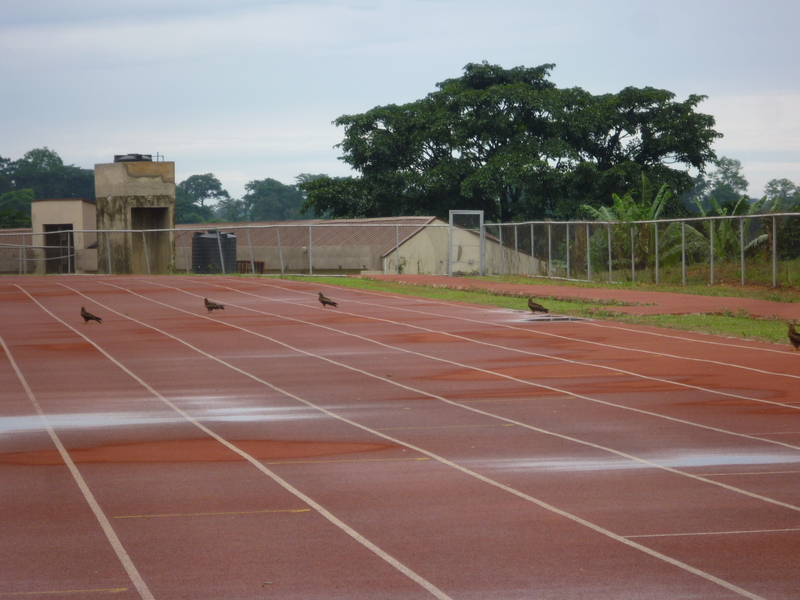 Birds stick to their lane on the University of Ibadan track. Apparently these birds come everyday to the track around twilight. 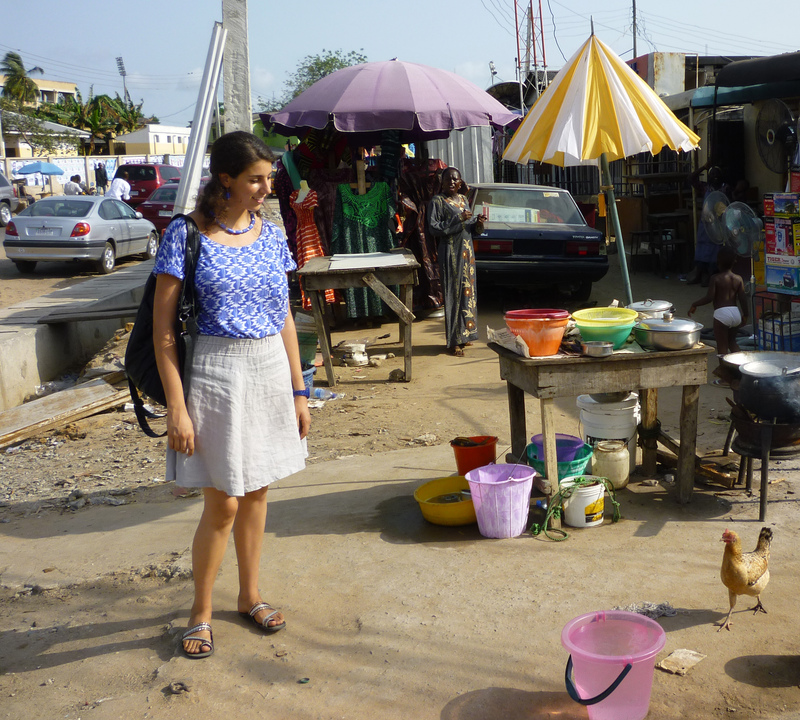 Shopping for ready made adire dresses in Surulere, Lagos. I just paused to observe the chicken next to me in this picture. Nigeria is a cash economy. If you want to buy a meal, you pay cash. If you want to buy a car, you pay cash. If you want to buy a cow (which is a very common item to purchase), you use cash. Finally, if you want to buy a house, you whip out a massive wad (you might need a Ghana-must-go bag) of cash. You don’t hear any Nigerians talking about payment plans, mortgage rates or credit card debt. When you buy something you pay for it in full, end of story. While credit cards do exist, they are used by the tiny upper class and only accepted at expensive hotels and restaurants. I’ve never heard a typical Nigerian (I’m excluding the upper upper class here) talk about how their stocks are doing, but I do see little stalls selling lotto tickets all around, although I’m not sure how that works yet. Nigerian currency is called Naira. 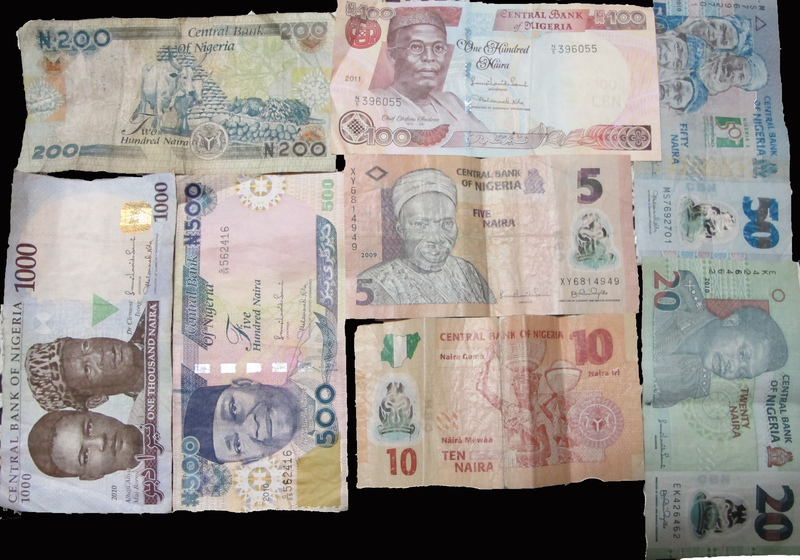 It comes in denominations of 5, 10, 20, 50, 100, 200, 500 and 1,000 Naira notes. They also have coins called kobobut no one uses them anymore. I’ve been here for 9 months and not once have I seen a kobo. The current exchange rate from Naira to U.S. dollars is about 153 Naira for $1. So 1000 Naira is about $6.50. If you are buying a car for $12,000 dollars, you will pay about 1.8 million Naira. Imagine what the amount of cash would look like. Checks are more common than credit cards but they are still scarce. So as a tip for travelers, bring cash, not travelers checks or credit cards to Nigeria. The vast majority of Nigerians do not have a bank account. An article stated that out of the 150 million or so people who live in Nigeria, only 22.5 million bank accounts exist. Many people cannot use banks because they are illiterate. If you can’t read, you cannot maintain a bank account. Many people do not want to deal with the wahala and stress of opening a bank account. When I went to open mine, I filled out my form, handed over my wad of cash then had to wait two whole weeks before I received my bank account number and my ATM card. When I returned a week later to see how far, the bankers said my money was in “ibi kan ti won n toju dada (one place they are taking care of it well).” Two weeks with no word about the whereabouts of my money? It’s no wonder many Nigerians distrust the banks and therefore choose to keep their money in a box under the bed rather than a bank account. A recent report from the World Bank said $6 million worth of transactions takes place on the streets of Nigeria everyday. These are hand to hand exchanges of pure hard cash, no swipe of the plastic included. This probably explains why a lot of the Naira notes I get are totally brown and hardly discernible. But the Central Bank of Nigeria–the bank that prints all the Naira– wants to move away from the dependence on cash. They recently announced a plan to limit the amount of cash an individual can withdraw to N150,000 per day. That’s about $1,000 per day. The new policy aims to start June 1, 2012. While this is still highernthan the limits on ATM withdrawal in the U.S. of $200, $400 or $600 depending on the ATM, it might impact Nigerians who pay for everything, even their homes in cash. I come from a country that covets the credit card, we even have key chain credit cards now. Many people don’t even carry cash anymore in the U.S. Living in a society that is entirely cash dependent is refreshing because I am never worried about paying my bills on time or my credit score. I still have my credit card here, tucked away in a safe place (I haven’t used it once). I don’t know if any other country is as cash dependent as Nigeria or what will happen to Nigeria as banks start limiting cash withdrawals and issuing credit cards. In the mean time we will watch with wallets open. This is an interesting article on this topic. I apologize for not blogging recently. The reason I have vanished is I am in Lagos and have been running around getting muddy at markets, attending art auctions (I went to the Art House auction at the Civic Center last night) and sitting in traffic. I threw this video together from some of the short clips I’ve taken here. When I get back to Ibadan I will sit down and write some long, thoughtful posts. 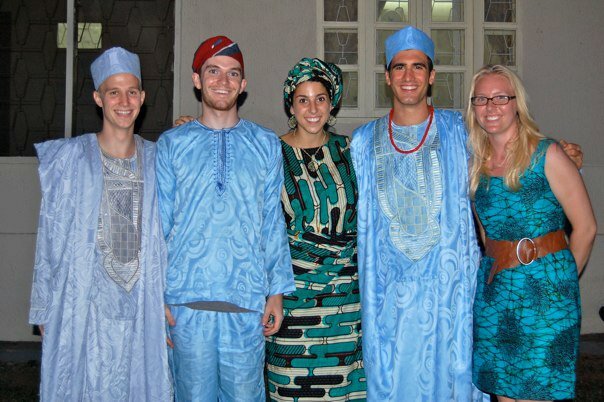 Yoruba traditional religion is something that always fascinated me while I was learning about Yoruba culture at the University of Wisconsin-Madison. Reading about it in books is nothing like experiencing it in person. 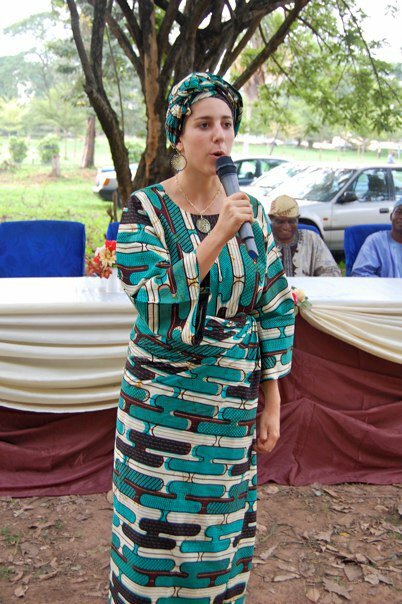 We had the chance to travel to Osogbo last month with Kayode’s drum teacher to attend a festival all about the Yoruba deities, called orishas. The title of this week long festival is Osunita. 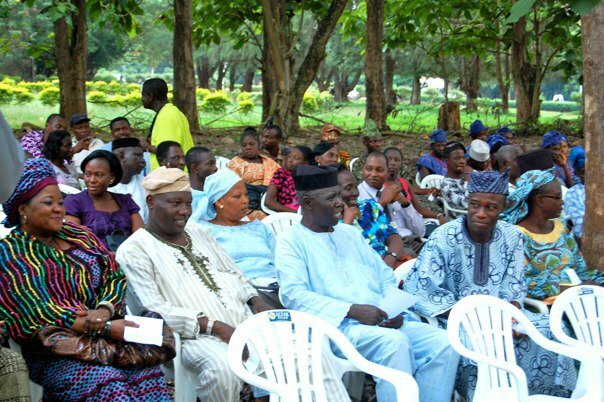 People from all over Nigeria come to Osogbo to honor Iya Osunita (the Osunita mother). Guests sacrifice to various Yoruba Orishas, including Iyalode, Obatala, Eshu, Osun, and Ogun. Yoruba traditional religion and the practice of Ifa divination is a huge topic and I am not attempting to delve into it right now. Today you hear people calling traditional things “fetish”. If something has characteristics of traditional religion or culture, people fear it and call it “fetish”. With the widespread reach of Christianity and Islam, the number of people worshiping Orishas and practicing Ifa is diminishing but from what I saw that day in Osogbo, there is still a strong population continuing the tradition. I want to show these pictures to help you get a sense for what a modern day festival is like.